What started off as a dull Christmas Eve for Gerald Vokey ended up becoming the highlight of his journalistic career. Mr. Vokey, the Beacon's business manager at the time, took his eight-year-old daughter to the Gander International Airport on Christmas Eve, 1976, to see what people or planes had stopped to visit. Outside the airport, Mr. Vokey learned from some airport workers that a very important person was biding his time in Gander. "They said 'You'll never guess who's in the dining room. Fidel Castro,' " said Mr. Vokey. The then prime minister of Cuba had spent the previous six days in Moscow helping the Soviets celebrate the 55th anniversary of the Russian Revolution. The IL-62 aircraft carrying his 15-man delegation was supposed to return to Havana via Montreal, but a blizzard in Montreal had diverted it to Gander. Not wanting to miss an opportunity to speak to the controversial leader of Cuba, Mr. Vokey got Jack James, the airport manager, to ask if Mr. Castro would like to see him. "A little while later, Jack got a note back to me saying Castro invited me to the dining room," he said. "So I went in and did an interview with him there, and following that he came outside." Mr. Vokey called Ian Blackmore, a Beacon photographer, who took a few pictures of Mr. Vokey's daughter with Mr. Castro. The Cuban leader then said he wanted to see Gander. "Jack had his vehicle, I had mine, and the RCMP officer at the time, John Foster, had the police car," said Mr. Vokey. "We took Fidel and his delegation around town." Eventually, the motorcade came to the James Paton Memorial Hospital. Mr. Castro noticed some children sliding down the hill behind the building, and decided he wanted to try it out. 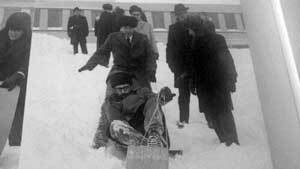 The president borrowed a child's toboggan and raced down the hill, falling off at the bottom, to the alarm of his bodyguards. "You'd have to see security with shoes on, up to their knees, almost to their waists in snow, going down to retrieve him," said Mr. Vokey. Afterwards, a group of nurses shook hands and chatted with the president, who communicated with the help of an interpreter. 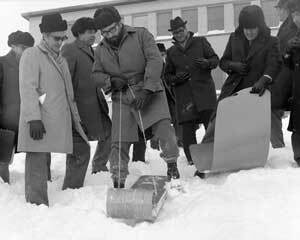 When the delegation saw a nurse trying to get her car unstuck from the snow, Mr. Castro volunteered to help, and shoveled her out. Mr. Vokey said it was much easier then to get close to a world leader than it is now. "What you see today when someone comes around is no comparison to back then," said. Mr. Vokey. "You were pretty well free to go and come as you please." 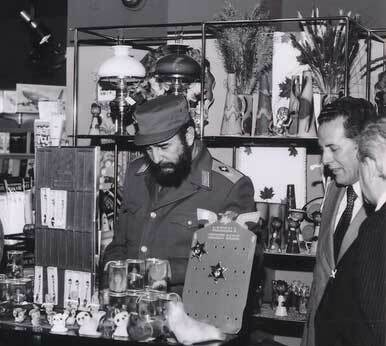 The language barrier was a challenge, Mr. Vokey said, but he managed to have a good conversation with Mr. Castro. "In the interview I did with him in the dining room, he was quite amiable and we discussed ... Cubana (Airlines) being taken care of in Gander by the Canadian people," said Mr. Vokey. “Gander was a main refueling point for Cubana. Cubana couldn't land in the United States for fuel and still can't. But Canada welcomed them with open arms and the crew used to overstay in Gander, and they were quite common around the airport and the malls." Mr. Castro informed the Beacon he was negotiating a hijacking treaty with the Canadian government. Canada's Minister of External Affairs at the time, Mitchell Sharpe, criticized the Cubans previously for negotiating such a treaty with the United States, but not Canada, noting the U.S. had banned Cuban aircraft from landing on American soil. After the interview and tour of Gander was over, the Cubans and their prime minister boarded the aircraft and took off for Havana. Mr. Vokey went on to manage the Beacon for another 23 years, retiring in 1995. "In the news business, some of the best stories are the ones you stumble upon, and I surely stumbled upon that one," said Mr. Vokey. "It really meant a lot to me to have that opportunity, and I was the only news media person there to be afforded that opportunity." Mr. Castro retired as president of Cuba on Feb. 18, 2008, at the age of 82, passing control to his brother, Raul. Mr. Vokey never heard from Gander's Christmas Eve visitor again. "It was quite interesting, and he enjoyed it," said Mr. Vokey about the visit. "He was a very congenial guy, and he still is a very congenial person."